I have a gluten allergy that makes my stomach hurt when I eat anything with gluten in it, especially whole wheat or processed foods. It isn’t Celiac (thankfully) but it is a pain nonetheless. I figured it out in about 2004/2005 and have worked since then to partially eliminate gluten from my foods, but not entirely. Since it isn’t a severe allergy, I can have some, about a slice of bread’s worth, per day. Most days I don’t eat bready at all, which is pretty neat considering this country loves everything with bread, meat, fried, or both. Anyway, this year I have gotten around to baking and cooking gluten free. I gave away about 2lbs of ap flour to Penny, then went out and bought everything I might need to go gf. I found America’s Test Kitchen How Can It Be Gluten Free cookbook at CostCo and it completely changed everything! It goes from which gf products work best, why, and even how to mix my own ap gf flour. I did that today and made some banana cookies based on a recipe from Bake at 350 (omg go there and drool). I modified it to use gf flour instead of regular ap flour, and used a trick with the bananas from another ATK book that gets a ton of banana flavor without the excess moisture gumming up the works. As far as my baking at high altutide (we’re, what, 6000ft? ish), I just crossed my fingers….and then…. They are so fluffy and they pack a sweet nanner punch of flavor. Look how well they rose! Normally I’d have flat, sad cookies. Num. I think I’ve eaten six of them so far and the fourth sheet is in the oven. To the baker go the spoils, friends, and victory is sweet. *Substitute the same amount of your favorite gf ap flour. * For the mashed bananas: freeze some brown bananas, about 3 or 4, and let thaw in a fine mesh strainer over a bowl. Keep all that liquid and simmer it to reduce it to about half the original amount. Add it to the bananas and mash, then measure out a cup for the recipe. P.S. Nanners are what bananas turn into when they ascend to a higher plane of delicious. P.P.S. I haven’t been paid or endorsed to talk about these methods or recipes. 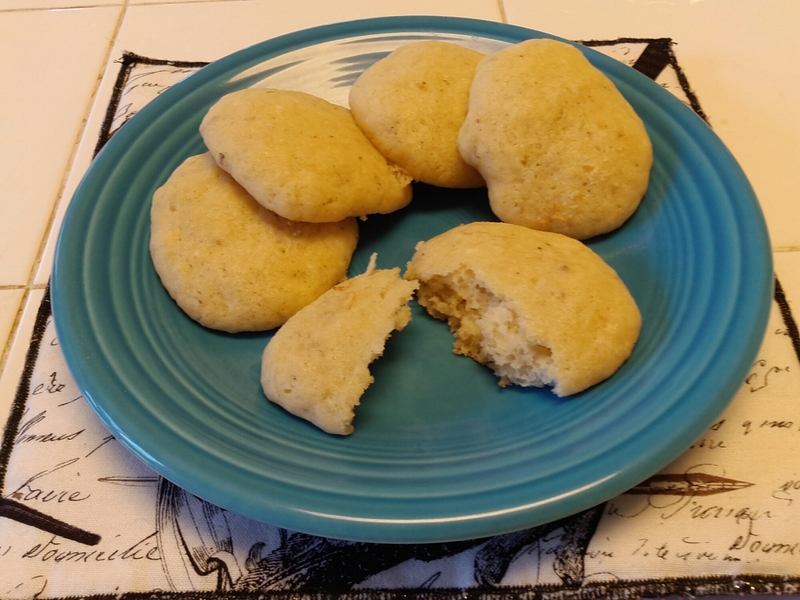 I did obtain (gratefully) permission to link to Bake at 350’s free recipe. It makes me deleriously happy to bake food I can eat without getting a stomachache! Thanks Bridget!